With most of the country experiencing extremely cold weather lately, I thought a nice comfort food recipe would warm some of you up. I know that a lot of people have a love it or hate it attitude when it comes to Meatloaf. I actually love it. But if you do not like it, no worries I totally understand....now go sit in the corner. I like tweaking recipes a little to add my own touch, plus I can say that it has a vegetable in it. So here is the recipe for my Bleu Cheese Spinach Meatloaf. I hope you enjoy it! In a large mixing bowl, combine all ingredients and mix until evenly combined. I mix it with my hands, messy yes, but this way really gets all the ingredients mixed together. I use a 9"x13" pan. Place half the hamburger mixture in the bottom of the pan , pressing down to get one even layer. Next, take your thawed spinach and sprinkle over your first layer then do the same thing with your crumbled bleu cheese on top of the spinach. Take the remaining mixture of hamburger and cover spinach and bleu cheese. Pressing down firmly. Take 1/4 cup of ketchup and spread over top evenly. Place in the preheated oven for 1 hour. Enjoy! I must admit, I am a real yard sale hound. If there is a yard sale on a Saturday morning I am there! Have you ever come across an item that you just can not pass up. The price is right, it's calling your name, you know the item that jumps out at you and screams "Buy ME and turn me into something else"! 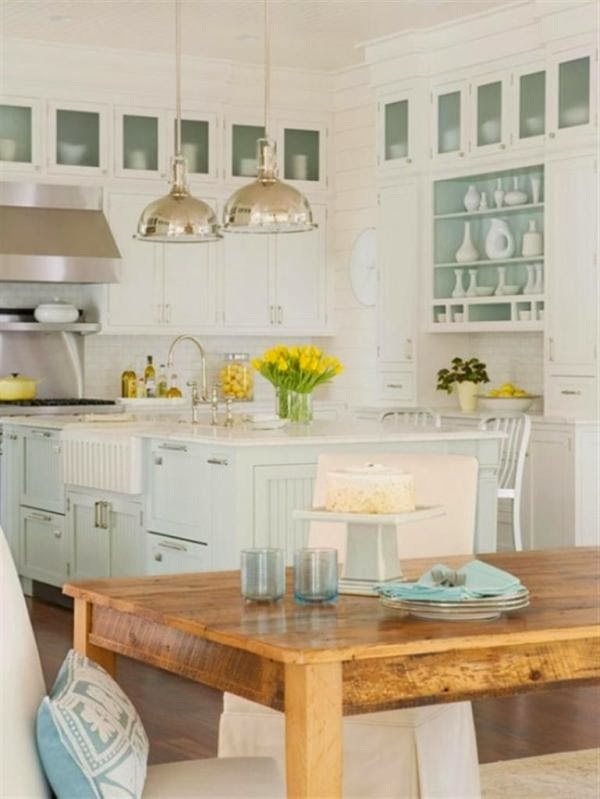 Have room in your kitchen for a chic addition? 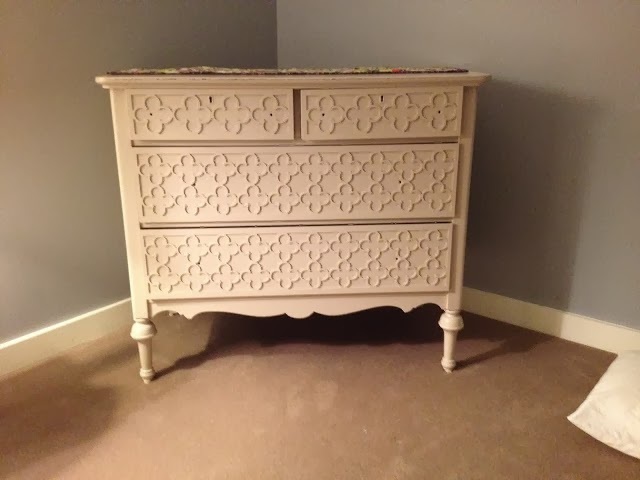 Have an old dresser you want to revive? and might I add essential part of any kitchen. 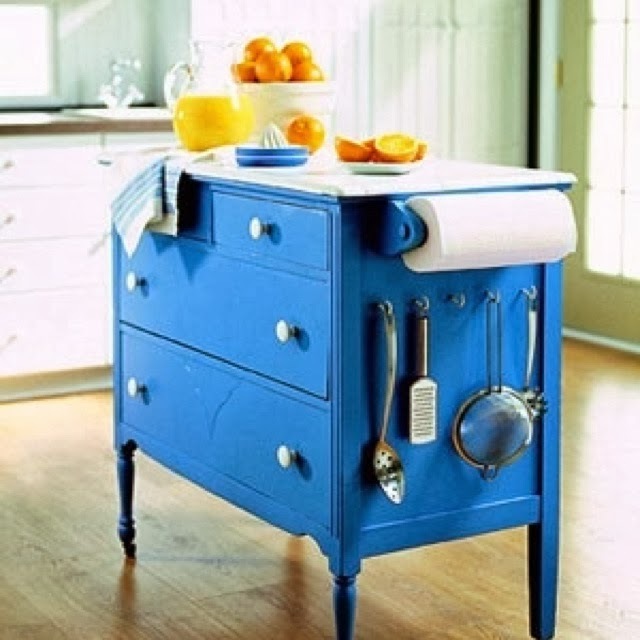 Add wheels, paper towel holder and hooks for utensils. 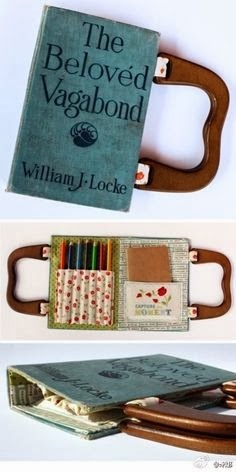 Use an old book by removing the pages, add handles. I do love this one. 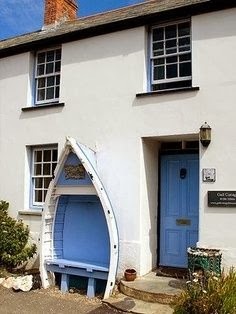 I just don't have an extra dingy laying around to do this though, bummer! 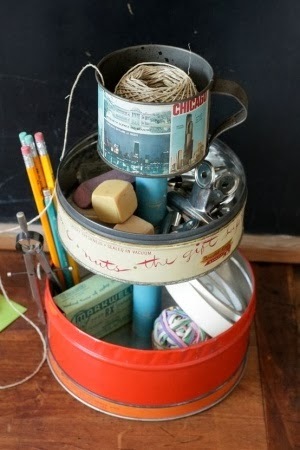 Old Tins make a great catch all for all things office or sewing. Center dowel creates the tiers. I could really use this in my sewing studio! Towels wash so easily and we are always buying new ones. 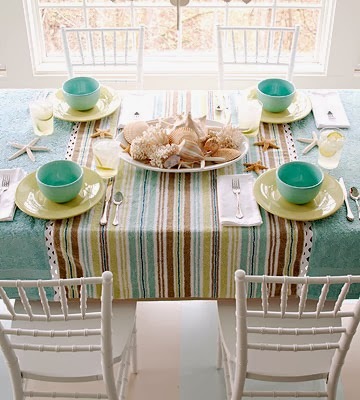 Give them a new life as a great outdoor table cover. 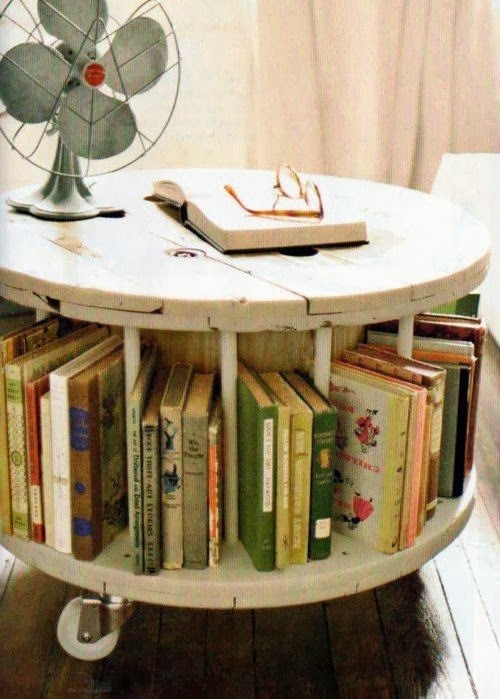 made from an old wooden spool for wire! 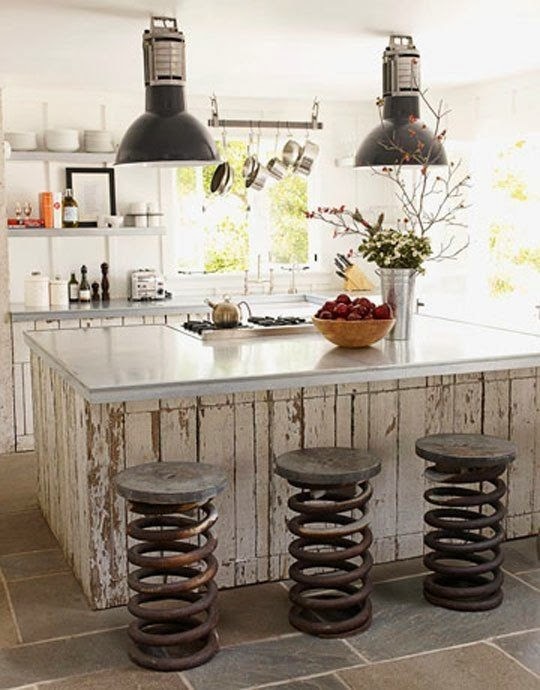 Repurposed Truck Spring Kitchen Stools. 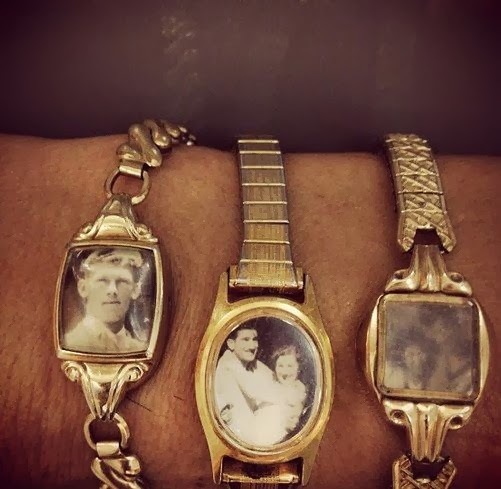 don't work anymore and putting locket size pictures in place of the clock face. 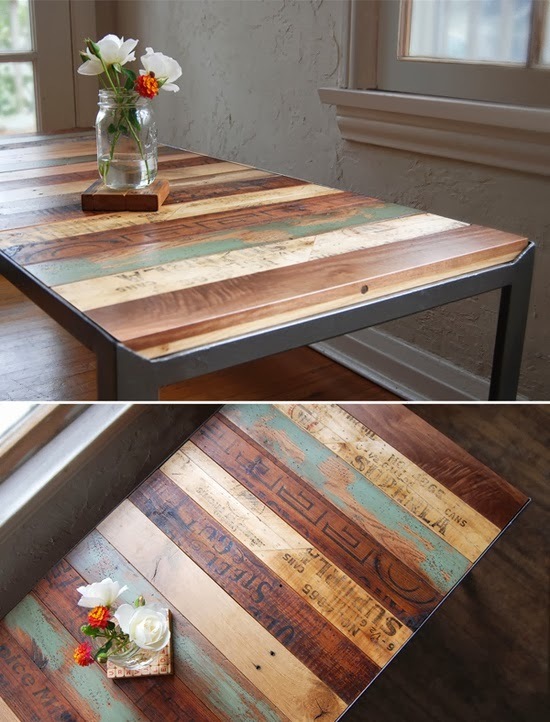 Pallet Table: Sand, cut & place, stain, varnish, done! 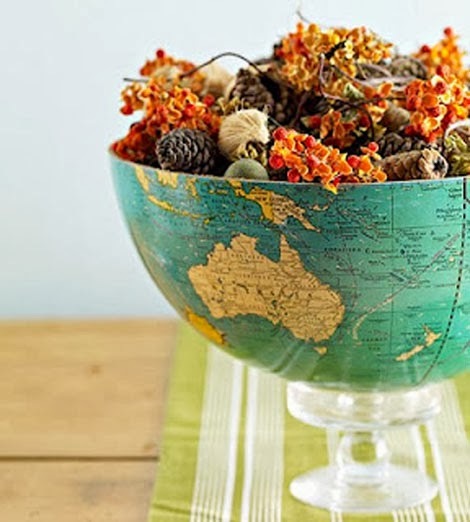 Take an old globe, cut it in half and you have a great place to put shells, or anything else. I hope your weekend is going great! The last room in my house that needs a little TLC is our bedroom. 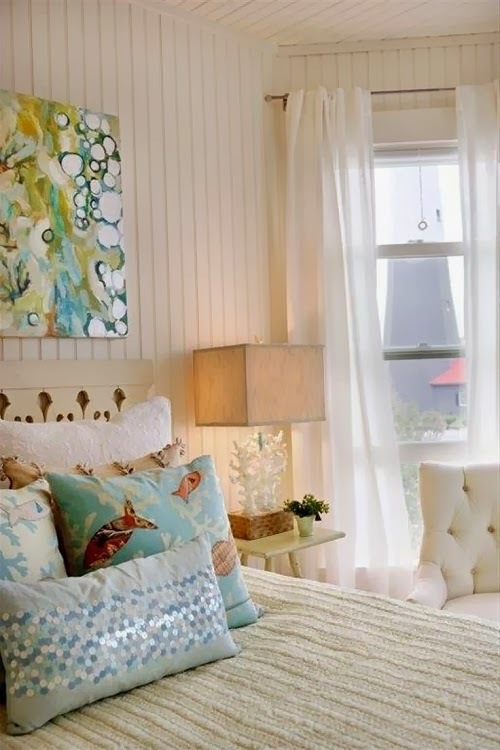 We have the bones like the bed/headboard and seating, and I even completed wallpapering with grasscloth the horrible mirrored closet doors (on a previous blog post) but I am still looking for the bedding and draperies. 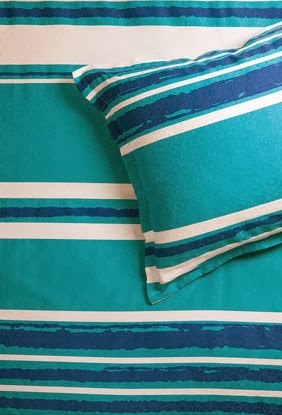 I make pillows for a living and you think bedding would be a no-brainer for me, but honestly when I make something for myself that is the hardest decision for me to make. 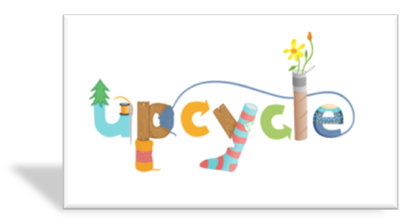 I search for inspiration where everyone else does, online and in magazines. 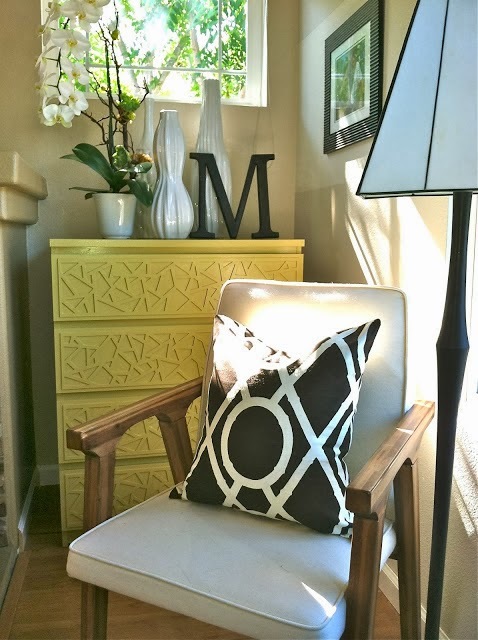 I am of the mindset that paint is one of the easiest and most inexpensive ways to change a room. Everything else is icing. 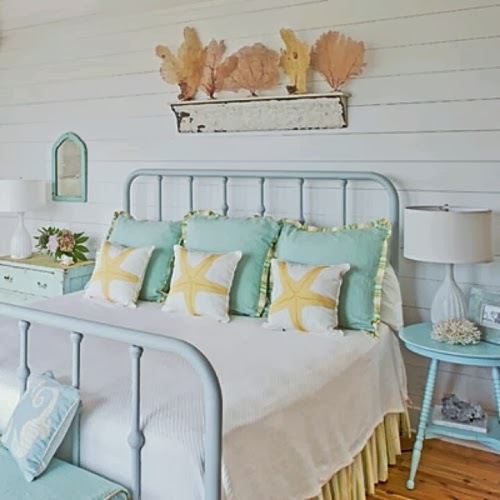 With just a few ideas like the one's below you can turn any bedroom into High Seas Style! Grass cloth comes in so many colors. 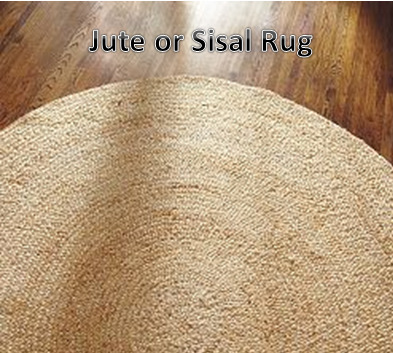 POP-of COLOR Bedding and a Sisal or Jute Rug. 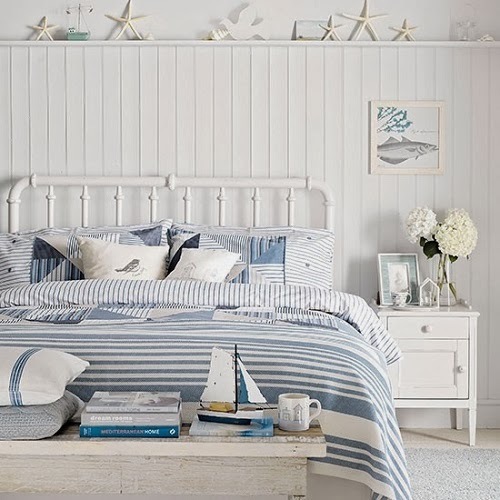 Who better to go to for colorful Bedding.......Trina Turks Horizon Stripe. 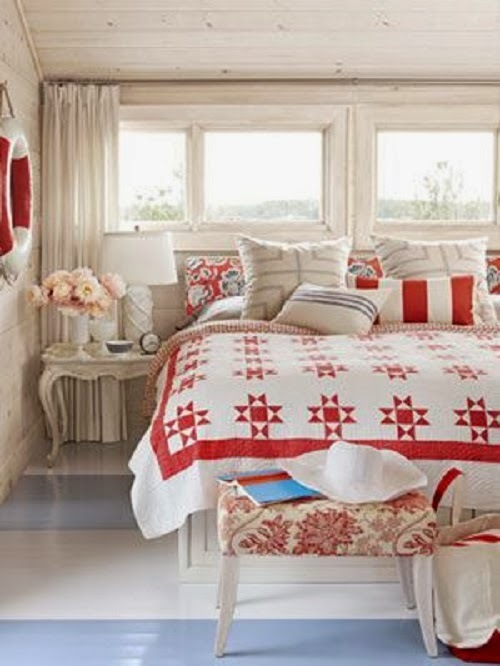 Pretty Red & White Quilt. and check out this painted floor! Mix Red Patterns. 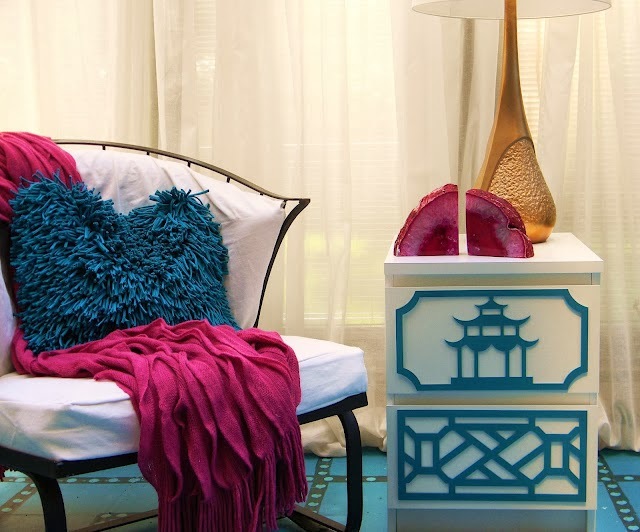 I am always looking for that great find whether it is a piece of furniture or an incredible fabric. When I see something I like my mind starts spinning with ideas on what way I can change or enhance or use it for. 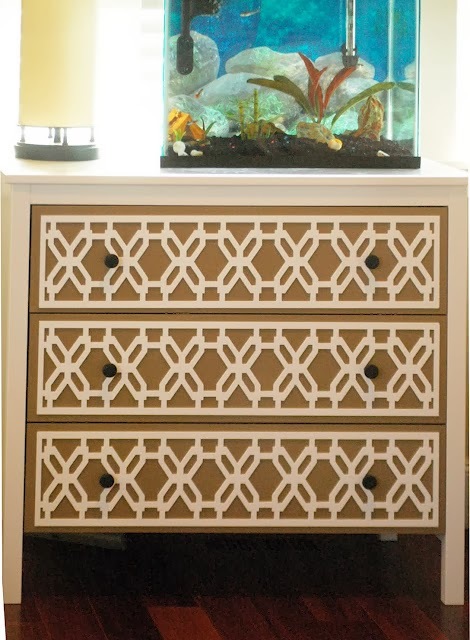 Over the past year I have come across many an article showing fretwork on furniture. Many styles. 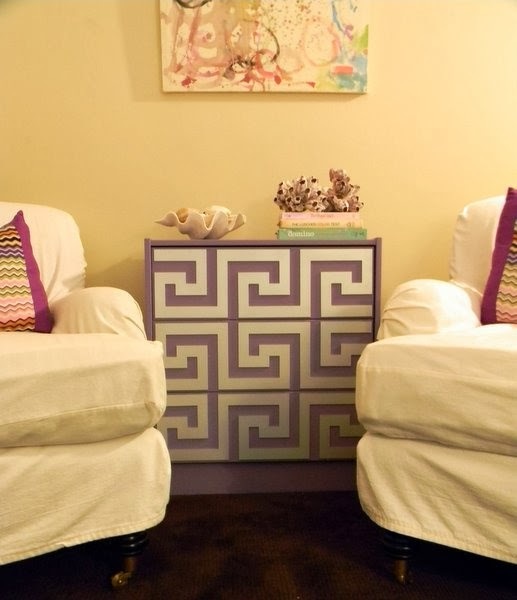 Greek Key, Geometric, Swirls to name a few and not only on new furniture, but vintage pieces as well. 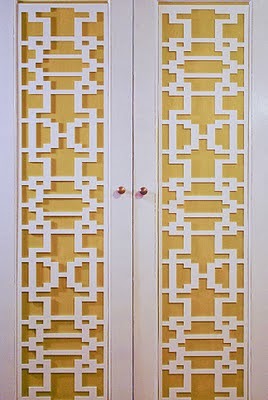 Last week I came across a web site that not only sells premade fretwork in many styles, but sells styles that transform and are sized to fit IKEA pieces. 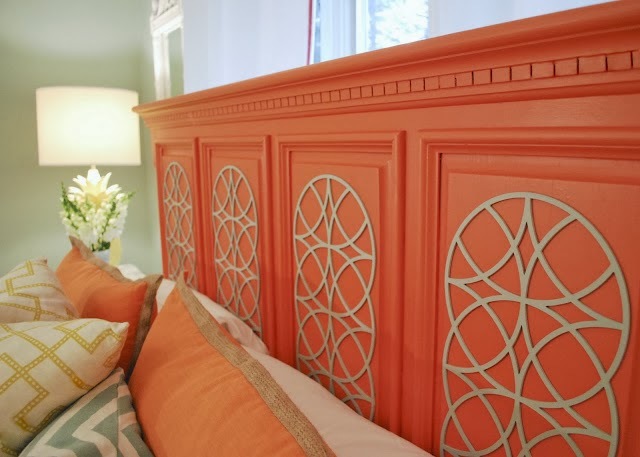 O'verlays are fretwork panels made of paintable, slightly flexible material. 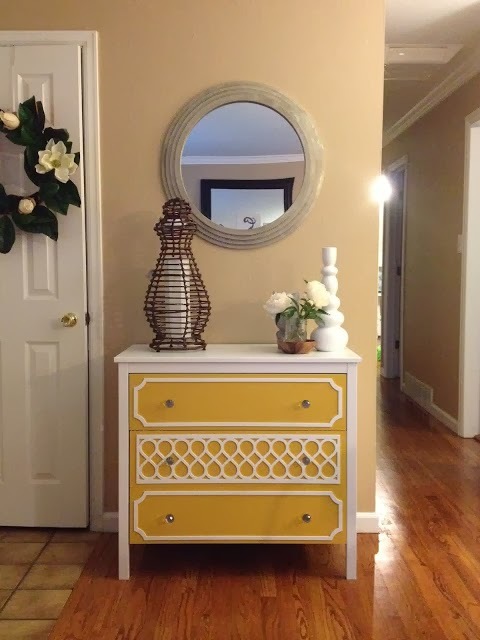 Custom orders are welcomed for non IKEA pieces. I absolutely love them all. Which one is your favorite? 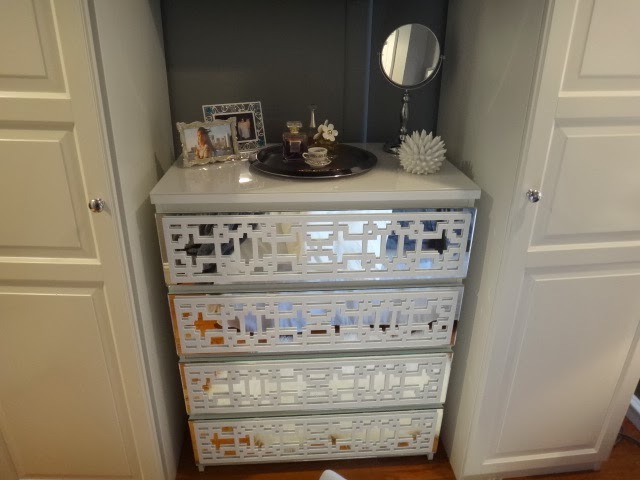 Yard Sale find transformed with mirror and Custom GiGi panels. Harper 2" strips on vintage dresser. 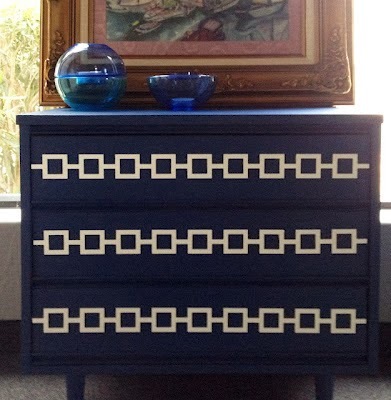 IKEA RAST 3 drawer with Greek Key panels. 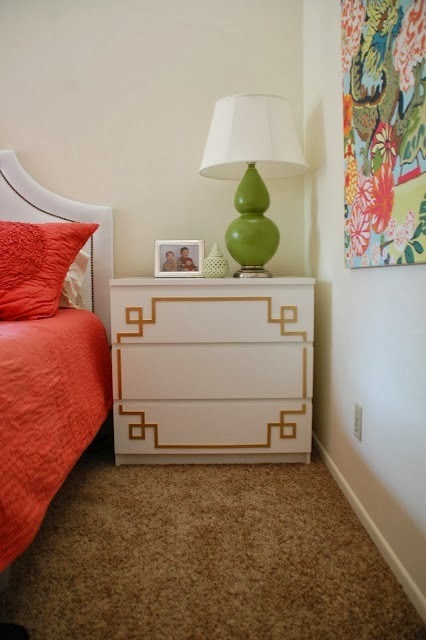 IKEA MALM 4 drawer with Danika panels. IKEA MALM 3 drawer with Bubbles overlay on mirror. 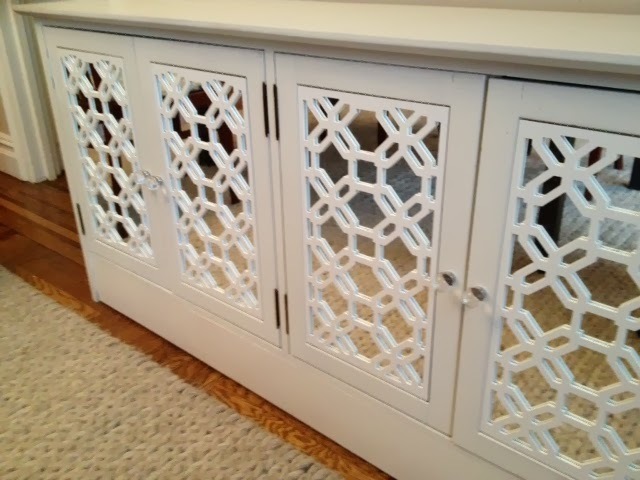 Quatrefoil panels on vintage dresser. IKEA MALM 4 drawer with Caci panels. Love Love LOVE this one!!! 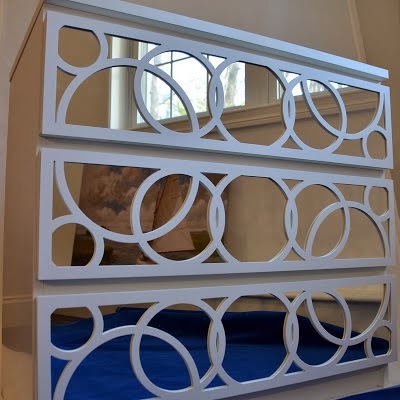 O'livia panels on IKEA MALM 3 drawer. Let There Be White ! Hello and Happy Tuesday Everyone! 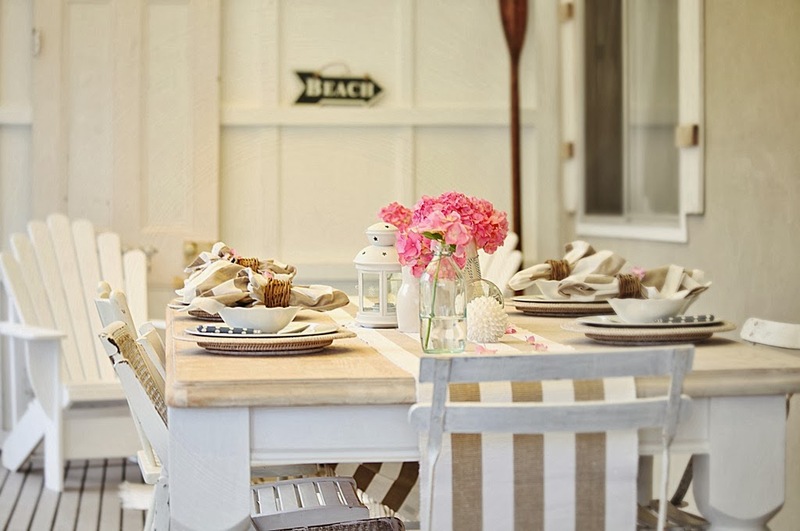 If you love thumbing through coastal magazines as much as I do, you will find the ongoing theme of decorating with white. 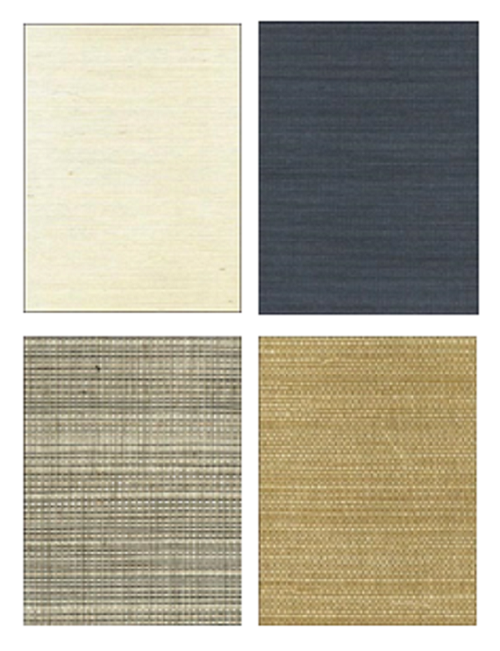 Not just white walls and ceilings, but white furnishings and accessories. I know, I know, you are probably thinking white is so boring. Think again. 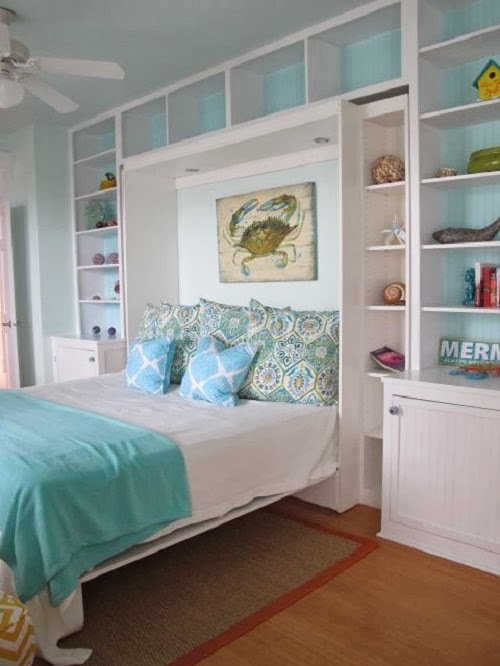 Using white as a foundation on walls and ceilings make other hues pop. 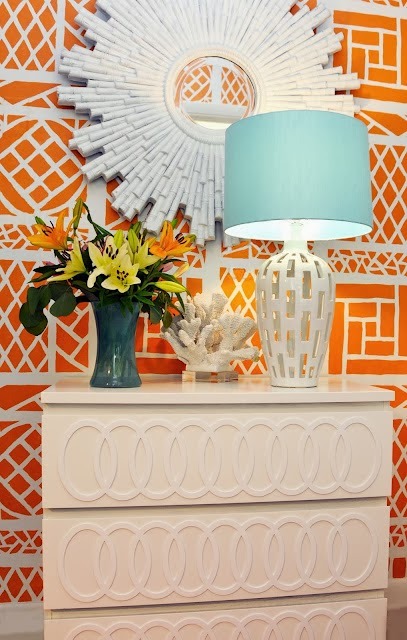 White brightens a room, gives you the illusion of a larger space and highlights everything around it. There are so many shades of white and if you look carefully at the undertones, some are blue, pink, and even green. My favorite white paint is BEHR's Plantation White. I have used it for over 10 years, but there are so many more to choose from (See list below) I strongly recommend painting a 24" square of the paint color on the wall that way you can experience the color at different times of day, to see how the light changes it. So the next time you think, whites not a color, think again, it is a color and a versatile one at that! 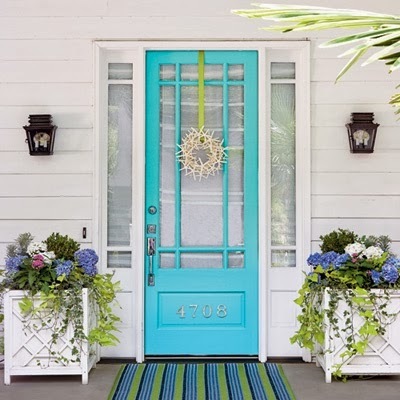 Even Outside.......Turquoise pop of color on an all white exterior. All white (even the floors are painted) with touches of tan. Layers. Textures in fabric and wood.